The Les Paul Studio Deluxe II '60s Electric Guitar raises the bar with the cutting-yet-rich tone of a 490R humbucking pickup in the neck position and a BurstBucker Pro humbucking pickup in the bridge position, which are mounted on a carved maple top with a mahogany back. Both pickups offer coil splitting for single-coil sounds and a boost circuit via push/push switching in the volume controls. œStraight Split coil-splitting offers pure single coil tone and differs from LP Standards and Studios that have a œSuper Tap coil-tap, which still has a small amount of humbucking. The boost circuit has a user-adjustable 10-dB boost for added power and frequency range for solos, single-note picking and dirty chording (depending on amp settings) and features true bypass that disengages the boost completely, ensuring pure passive Les Paul tone. Don't settle for less. Order your Les today. 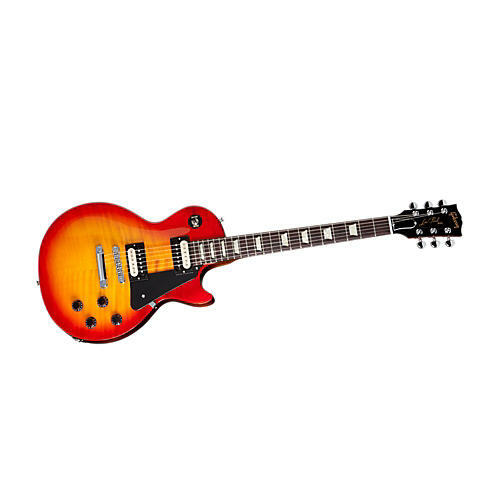 Nut width: Standard Gibson: 1.695" ±.050"
Truss rod cover: Bell-shaped cover, stamped "Deluxe"